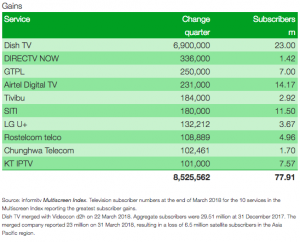 An apparent slide in numbers in the Asia Pacific region drove down the overall TV service subscriber total in Informitv’s Multiscreen Index for the first quarter, with fewer than half the services covered globally reporting subscriber gains. According to the Multiscreen Index, the cable, satellite, telco and online services covered recorded a loss of five million subscribers, or 1.14%, over the three months to March. The main driver was a reported loss of subscribers in the Asia Pacific region following the merger of Dish TV and Videocon d2h in India. The pair previously reported a total 29.51 million subscribers between them. After merging in March, the enlarged Dish TV had 6.9 million more subscribers than it in the previous quarter. However, the combined company appears to have suffered an apparent loss of 6.51 million from the previous combined total. Excluding Dish and Videocon d2h, the Multiscreen Index rose by 1.49 million subscribers, or 0.36%, much lower than in any previous quarter. The average quarterly gain over the previous three years has been about 4.5 million. Dish TV is now the biggest TV provider covered with 23 million subscribers, ahead of US pay TV providers Comcast with 21.21 million and DirecTV with 20.27 million. AT&T has more subscribers overall between its different services in the US, with a total of 25.32 million between U-Verse and DirecTV Now, and is the largest player considered as an international group, with 38.89 million across the Americas, up by 93,000. The TV subscriber total in the EMEA region rose by 0.19 million, with the top 10 players recording a joint net loss of 112,000, driven by a continued haemorrhage at Canal+, which lost 212,000 customers in the quarter. The top 10 services in the US also lost 212,000 subscribers net, with only three – led by DirecTV – reporting gains. “Traditional television subscriber numbers are flat or falling for some services and tracking them through mergers and acquisitions, together with changes in reporting methodologies is increasingly complex,” said William Cooper, the editor of the informitv Multiscreen Index.